From next year all tortoises will be required to undergo a series of strict tests in order to obtain a certificate of roadworthiness. The number of tortoise-related deaths on our roads has risen steeply over the last five years, and the new MOT* tests are designed to ensure that such tragedies are kept to a minimum. 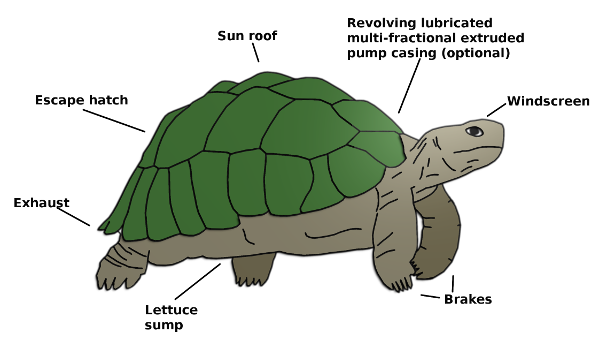 The penalties for operating a dangerous, misfiring or wantonly destructive tortoise will be severe and owners of such animals can expect a heavy fine. Many people may find this new legislation daunting, but will be glad to know that we here at Autoshell can put your mind at ease. We have been dealing with reptiles since 1917 - both professionally and on a more casual basis - and we know our way around tortoises better than anyone. As a fully licensed tortoise testing station, we can guarantee to give your knobbly little friend a complete work-over, including thorough chassis inspection, oil change and emissions test. We'll even valet it for free!